Vadym Meller or Vadim Meller, (Russian: Вадим Георгиевич Меллер;Ukrainian: Вадим Георгійович Меллер, 1884–1962) was a Ukrainian-Russian Soviet painter, avant-garde Cubist, Constructivist and Expressionist artist, theatrical designer, book illustrator, and architect. In 1925, he was the first artist to be awarded a gold medal in the Exposition Internationale des Arts Décoratifs et Industriels Modernes (Art Deco) in Paris. Vadim Meller was born in Saint-Petersburg. He was the second son of a top official in the Ministry of Justice in the Russian Empire. His father, George Meller, was a noble-born Swede; his mother, Helena Caruso, was half Italian and half Greek, and also from a noble family. He married Nina Genke. Vadim Meller died in Kiev. From 1903–1908, Meller studied at Kiev University. In 1905, he visited Geneva, Switzerland, where he took art lessons at the private school of Franz Roubaud. In 1908, with the recommendation of Roubaud, he continued his education at the private art school of drawing and painting of Heinrich Knirr in Munich, Germany. There, Meller met fellow student, Paul Klee, who introduced him to Der Blaue Reiter group. After graduating from the Kiev University with a degree in law, he acquired an artistic education in the Munich Academy of Fine Arts from 1908–1912. V. Meller stayed in close contact with Der Blaue Reiter group. During this time, he also met Wassily Kandinsky, with whom he became friends. V.Meller started to exhibit his works after moving to Paris, where he joined the Société des Artistes Indépendants.At the same time Vadim Meller was a student of Antoine Bourdelle. In 1912–1914, together with Kazimir Malevich, Sonia Delaunay, Alexander Archipenko, and Aleksandra Ekster, he participated in a number of exhibitions (Salon des Indépendants, Spring Salon, and Salon D' Automne) alongside Pablo Picasso, Georges Braque, and André Derain. 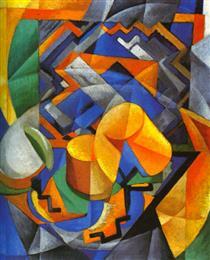 After returning to Kiev in 1915, he worked at easel and monumental painting, graphic design, and costume design. 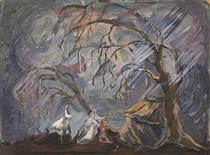 His transition to scenography as his main field of artistic activity took place in the post-revolutionary years. From 1918–1921, he worked with scenographer and dancer Bronislava Nijinska (Vaslav Nijinsky's sister) in her ballet studio. 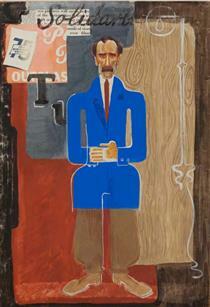 In end of this period he became a professor in The National Academy of Fine Arts and Architecture. In 1922, Les Kurbas invited V. Meller to the recently founded Berezil' theater. In 1925, V. Meller, together with Sonia Terk, Alexandra Exter, and Nathan Altman, participated in Exposition Internationale des Modernes (Art Deco) in Paris. There, Meller was awarded a gold medal for his scenic design of the Berezil' theater. That same year, V.Meller participated in the International Theater Exposition in New York. 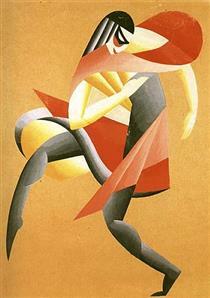 V. Meller became the leader of the Constructivism movement in Ukrainian theater design. 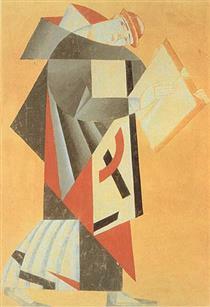 He worked in the National theater as a chief artist until 1945. From 1925 onward, he also taught at the Kyiv Art Institute (Wikidata) (KKHI) together with Vladimir Tatlin and Alexander Bogomazov. Also in 1925, V. Meller became a member of the artists union Association of the Revolutionary Masters of Ukraine together with David Burliuk (co-founder), Alexander Bogomazov (co-founder), Vasiliy Yermilov, Victor Palmov, and Khvostenko-Khvostov.